Golf is a game of passion, discipline and tradition. Give your passionate golfer one of these Top Ten Golfers Personalized T-Shirts showing that your favorite golfer belongs among the finest golfers in the world. Our Top Ten Golf Personalized Shirt is available on our premium white 100% cotton T-Shirt in adult sizes S-3XL. Each machine-washable Personalized Golf gift shirt is also available in Ash Gray. Golfer gift ideas include FREE Personalization! 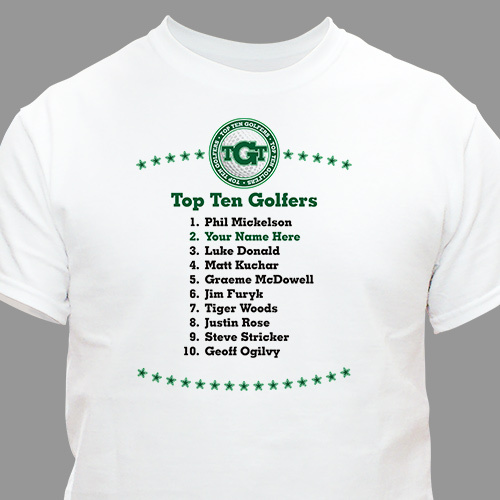 Personalize your Top Ten Golfers T-Shirt with any golfer's name. Great idea for an avid golfer! Haven't seen the gift yet, but was well liked by recipient.